Having braces in West Jordan uncovers unique concerns. At Jordan Landing Smiles, we support healthy oral hygiene and regular, consistent check-ups. Hygiene for braces is a bit different. Sports are the center of life for many families. We’re an active community. A quality mouth guard provides important protection for both your teeth and braces. An alternative is Invisalign clear braces. 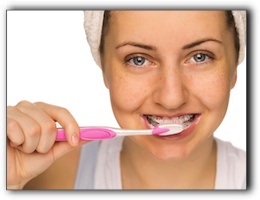 Invisalign is new approach to straightening teeth. Patients wear a series of clear aligners that gradually bring their bite into proper alignment. Unlike conventional braces, there are no wires and no metal. These aligners can even be removed at mealtime, and to brush and floss your teeth. Invisalign clear braces are available from Jordan Landing Smiles. We also offer general dentistry. Schedule an appointment with us today.